FORT MYERS, Fla. (AP) Jake Odorizzi joined the Minnesota Twins just in time for their first full-squad workout of spring training. He had a sense he’d land with them, actually, and it was a good feeling. Leaving behind the Tampa Bay Rays teammates he’d become close friends with wasn’t fun, but leaving an organization cutting salary for one coming off a postseason appearance was a welcomed trade. ”I’m glad to have that closure now, where I don’t have to worry about it each day waking up like, `Is this could be the day I have a new team?”’ Odorizzi said. That moment came on Saturday night, when the Rays sent the 27-year-old right-hander to the Twins for minor league shortstop Jermaine Palacios. The Rays, who let several key contributors from last season become free agents before dealing cornerstone Evan Longoria in December, also designated All-Star Corey Dickerson for assignment on Saturday while acquiring first baseman C.J. Cron in a separate trade. The Twins, meanwhile, have added about $21 million to the 2018 payroll with Odorizzi enhancing the rotation and free agents Fernando Rodney, Addison Reed and Zach Duke boosting the bullpen. They’re also paying Michael Pineda $2 million while he rehabilitates from Tommy John surgery for the chance to add him to the rotation in 2019, and they’ve got an agreement in place with reclamation project Anibal Sanchez for another $2.5 million this year pending a passed physical exam. 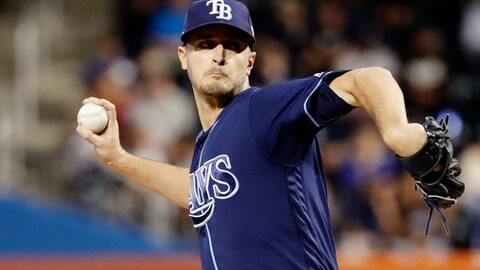 Odorizzi, who came to the Rays before the 2013 season from Kansas City with Mike Montgomery and Wil Myers in the seven-player trade that sent James Shields and Wade Davis to the Royals, logged four solid years as a starter for the Rays. He regressed last season, though, while struggling with some back trouble and posting a 4.14 ERA in 28 starts. He at least finished strong, with a 3-1 record and a 1.03 ERA in five September starts. Neither he nor the Twins expressed any concern about his health. Odorizzi was given the cubicle next to Ervin Santana, whose injury made his acquisition all the more important for a Twins team that used 16 different starting pitchers in 2017. Santana arrived on Monday, wearing a dark blue cast on his right hand after having surgery to remove a calcium deposit that developed around the knuckle on top of his middle finger. He said it bothered him while trying to throw a slider or a changeup in the AL wild-card game loss in New York when he gave up four runs on two homers in just two innings. Santana’s contract would vest for 2019 with 200 or more innings in 2018, but he’s unlikely to reach that threshold now with a return not expected until mid to late April. The Twins could decide to exercise the option themselves for $14 million or buy him out for $1 million and make him a free agent. In the meantime, he’s happy to have Odorizzi in the rotation. ”We needed that. So hopefully we’re not done yet,” Santana said. The only hiccup for the Twins on their first official day together as a complete team was a kidney stone that sent All-Star second baseman Brian Dozier to the urologist. Manager Paul Molitor gave the customary big-picture address to the players in the morning.